The Liberal government plans to extend its NATO leadership role in Latvia for several years, CBC News has learned. Prime Minister Justin Trudeau will "deliver a strong message" of solidarity during his bilateral visit to the Baltic state, said several sources from Defence, Foreign Affairs and other government departments. Canada's mission leadership role faces a self-imposed government deadline of spring 2019. It's now expected to continue until at least 2023. In the run-up to this week's NATO leaders summit in Brussels, considerable attention has been focused on the creation of a so-called "division headquarters" for the three NATO battle groups operating in the Baltics. That headquarters is slated to be established in Riga, Lavtia's capital. It's expected Canada will deploy staff officers to be part of it, one diplomatic source said Monday. The headquarters is seen as necessary to coordinate and support the battle groups in the event of a major confrontation with Russia. Announcing the extension might serve the Liberals well in the current political climate. Trudeau's statement on Canada's "key contribution" will be delivered just ahead of what's expected to be a contentious meeting of NATO leaders in Brussels July 11-12. U.S. President Donald Trump has already shaken things up in advance of the meeting by preemptively chastising allies who don't meet the alliance's defence spending targets. Canada's 450 troops form the nucleus of a multinational battle group in Latvia that includes soldiers from Albania, Slovakia, Slovenia, the Czech Republic, Poland, Italy and Spain. NATO military planners anticipate the deployment of battle groups in Latvia, Estonia and Lithuania — intended to stave off Russian incursions in the region — could last a decade and they have been quietly preparing for that possibility. At the same time, Canada has been securing acknowledgements from its partner nations that they are prepared to stick around, said a confidential Department of Defence source. Trudeau will address Canadian troops and soldiers from those other nations during his visit. He and Latvian Prime Minister Maris Kucinskis are expected to emphasize unity in the face of Russian interference in eastern Europe, including the ongoing war in Ukraine. 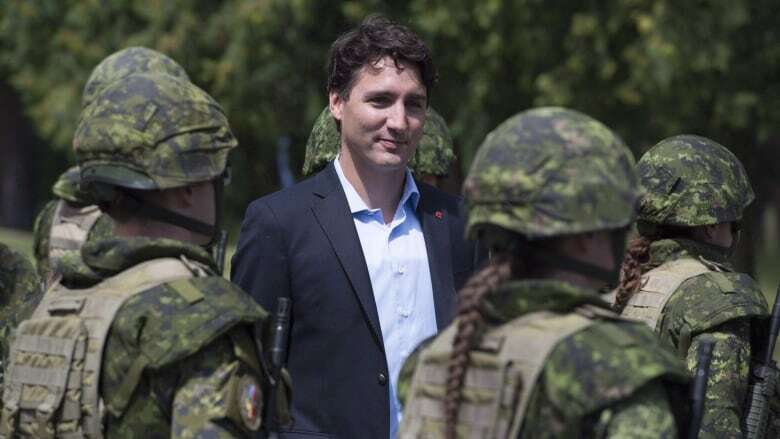 Canada has often been criticized for not meeting NATO's two per cent defence spending target and officials have been bracing for a Trump tirade, given the U.S. president's frequent, sometimes personal attacks on Trudeau. The alliance summit in Brussels will be the first time the two men have met face-to-face since the acrimonious G7 summit in Charlevoix, Quebec last month. At a rally this week in Great Falls, Montana, Trump delivered a clear message: "I'm going to tell NATO, 'You gotta start paying your bills. The United States is not going to take care of everything.'" Justin Massie, a professor of political science at the Université du Québec à Montréal, said extending Canada's mission is a gesture that likely will be be lost on Trump. "It's probably not going to satisfy President Trump, not whatsoever," Massie said. "President Trump has a very different view of NATO, a very much transactional view of NATO where he seeks money from allies in exchange for American security." 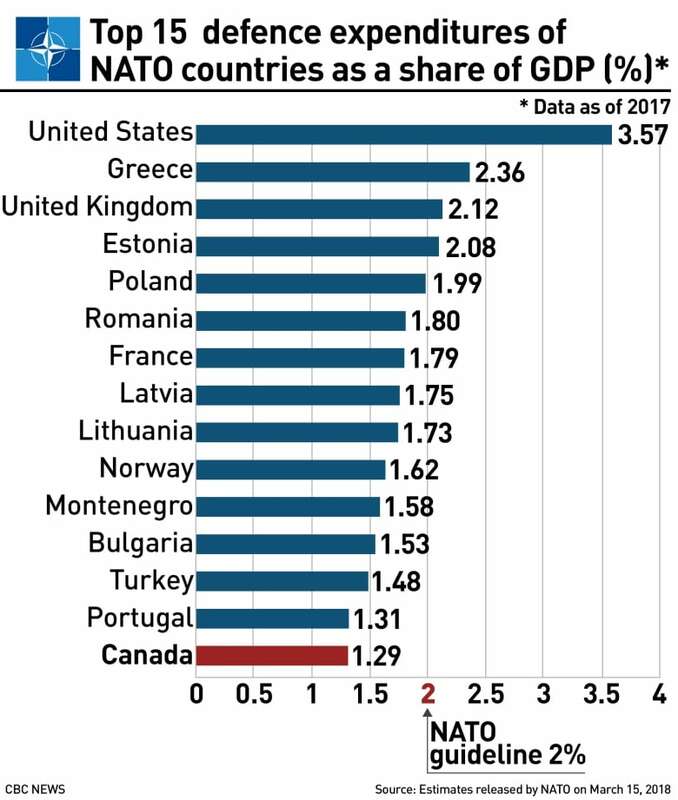 Canada spends approximately 1.29 per cent of its gross domestic product on defence — a far cry from NATO's two per cent goal. Even under the Liberal government's new defence strategy, which will see a 70 per cent hike in allocations over the next few years, that ratio is only expected to reach 1.4 per cent of GDP. Both the previous Conservative government and the current Liberal one have insisted that showing up with troops and equipment is just as important a measure as spending. The Department of Defence argued in a recent report that Canada has little choice but to extend its presence in Latvia, which costs taxpayers $134 million per year. The result of pulling out next year would be "closing doors, letting down old and new friends, wasting human and political capital, along with the political-military credibility Canada's commitment to the [enhanced forward presence] has generated," said the report by the Macdonald-Laurier Institute. One of the authors, Joel Sokolsky, said the fallout of a withdrawal from Latvia in the current political climate would be harsh. 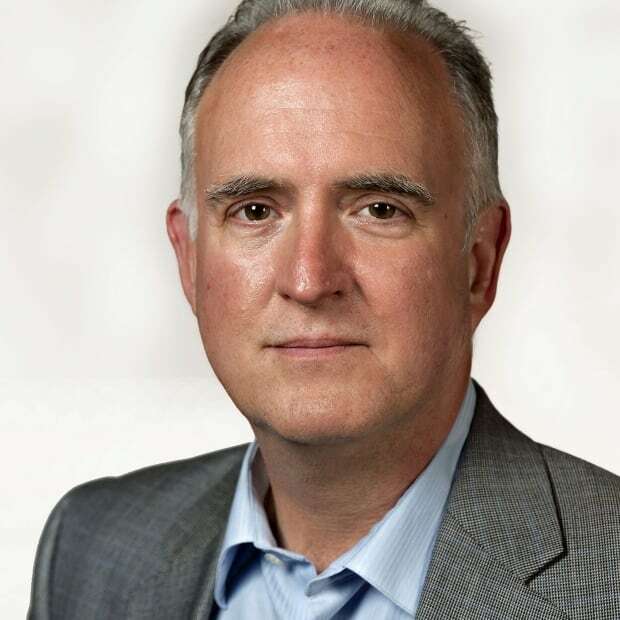 "It would reinforce the perception, which isn't quite correct, of Canada being (a) laggard," said Sokolsky, a professor at the Centre for International and Defence Policy at Queen's University in Kingston, Ont. He said a decision to bail on a leadership role would not only damage the alliance but Canada-U.S.relations as well — relations which are already under severe strain because of the looming trade war and the Trump administration's imposition of tariffs. The report warns, however, that the calculation could change — depending on how Trump handles the NATO summit. Defence experts have raised the prospect of the U.S. pulling back militarily from Europe, a notion officials in Washington have attempted to downplay. Even so, Trump could make decisions that would force Canada to re-evaluate its position. "For Canada and Europe, the most worrisome possibility is U.S. disengagement — a spectre raised by President Trump's behaviour at the Singapore Summit with North Korea, where he offered to sacrifice U.S.-Korean military exercises while floating a general pull-back of U.S. Forces," said the report. "If that happens along NATO's frontier with Russia, Canada would have to consider whether to recommit alongside European allies to show its faith in NATO — but without America's supporting presence. That, in itself, would raise questions about the very future of NATO."